Sew Inspired: PQS3. And more. Isn't it cute! I love the prairie points, I've got to try those one of these times. It was made by Ruth, aka ruthiequilts (link goes to her flickr stream). The trick to quilting with the walking foot and not having shifting problems, at least for this quilt, was to loosen up my presser foot pressure a bit. 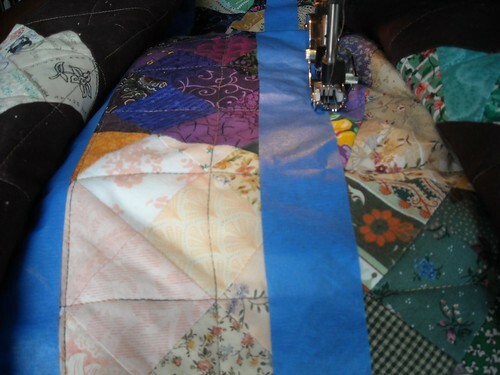 There are a few places in this quilt where parts were eased to fit and could have been a problem to quilt, but the quilting went really well and I didn't have the shifting I had on my last quilt. I need to pull out the user manual for my Janome (I used the Viking to quilt this one) and figure out how to adjust the presser foot pressure on it for the next time I do straight line quilting. I did find time to switch out my walking foot for the quarter inch foot and make my blocks for The Block Swap 2. I had to add the blue outer strips on the left block because I mis-measured and it came out just a smidge too small. I kind of like it though, and think this might make a cool block even if done on purpose. These blocks will go to Jennie of Sunflower Quilts. 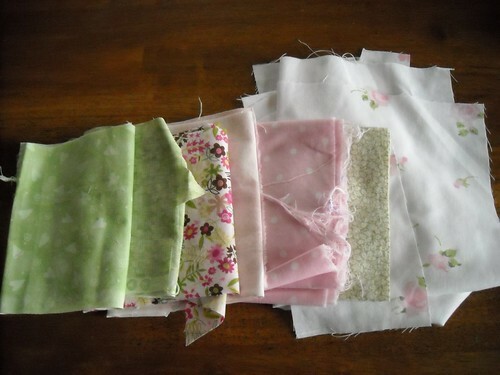 Love the pink and green fabrics you have picked out to make your swap placemat. I would love to read what you find out about your Janome! Love the blocks very nice job. Brown & blue - one of my favorite combos! i have a question or two, i am making... will be making.. a 'baby clothes quilt" out of my sons clothes, he is 3 and i will be using clothes up to now. i have plenty i believe to work with, but i was wondering if its easier .. more attractive.. etc to just do squares, or try for a pattern? i like the.. mermaid quilt that was in trips across the whole thing.. i was thinking maybe do stripes of coordinating colors varied throughout but going across in big strips like that one.. would that be hard with clothes? i am so nervous about cutting them, if i cut small its hard to fix but reg squares are easy.. but i cant decide on a pattern. i have never done an actual pattern just improvised on an idea of a pattern. im not good with measuring and the such. I'm totally ooohhhing and aaaahhhhing over the things in this post! 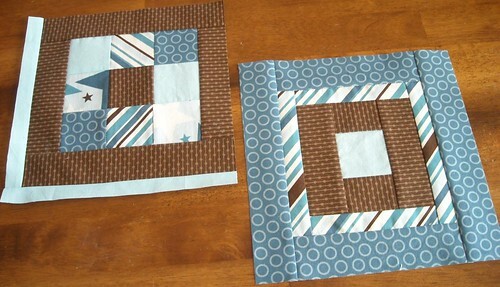 I love the placemat you got from your swap and the fabrics you pulled to make for your partner are really awesome! I also love the blocks you made for The Block Swap! Those are gorgeous! thanks so much all for the sweet comments! 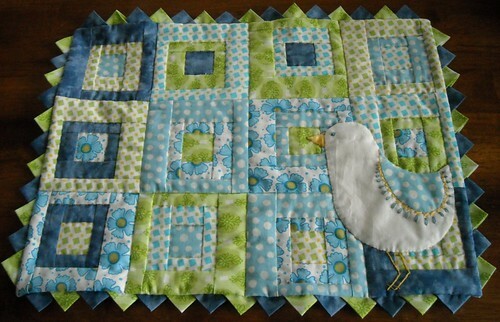 First, maybe you could try searching for baby clothes quilts on flickr and see what comes up. Something I've been thinking about doing though, for a baby clothes quilt, is maybe a log cabin/squares quilt using blocks similar to the ones I made for my vintage sheet quilts. I want to do one, eventually, with all the strawberry clothes my little girl has. You could start out the squares with varying sizes of fabrics for the middle and then use thick or thin strips, depending on what you can get out of the clothes. A strip quilt could be good too, maybe with strips of purchased fabrics and then rows of squares made from the baby clothes in between the long strips. I hope this helps, let me know what you decide to do! Wow--it looks like you have been busy! I like the fabrics you have pulled for your swap. I love this project, with blocks of logcabin and the bird. It is precious!!! oh thanks so much for getting back to me. i am nervous about cutting the fabric! haha but i will do that eventually. i will def think about the log cabinish idea, and see what i have to work with for the strip idea. i might have enough for both idk. we shall see. thanks so much for your help again.